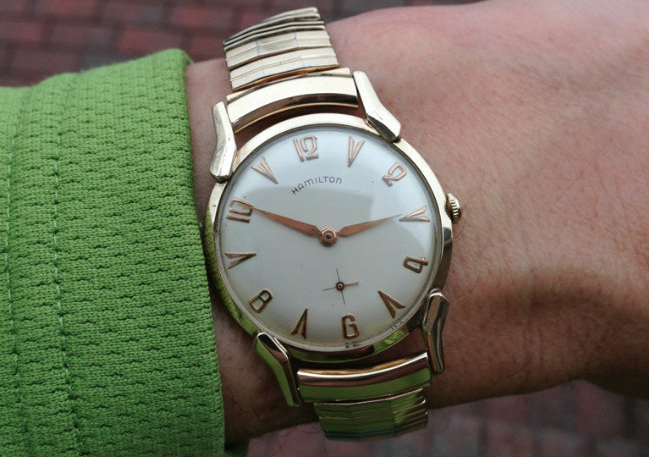 In the late 1950's Hamilton introduced an entire line of "Fine Hamilton Watches" that featured Hamilton designs with imported Swiss movements. The Swiss movements could be procured more cheaply than the US-made Hamilton movements and allowed Hamilton to provide watches at a competitive price point for other imported watches. An example of this "Fine Hamilton" line is the 1958 Coburn. The Coburn came in a 10K RGP case with a stainless steel back. The dial is embossed (stamped) with numerals and triangular markers. Under the dial is a 17 jewel Swiss-made Hamilton 673 movement. I believe it's an 10.5 ligne grade made by A Schild and identical to the A. Schild 1200 movement (if you're looking for parts). 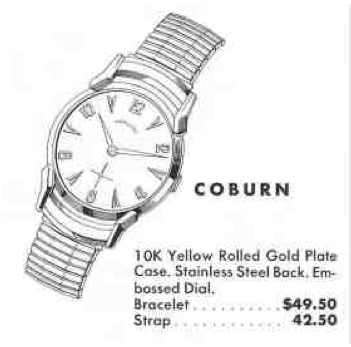 I recently purchased a Coburn in a group of project watches. It was very dirty but once I cleaned it up I was delighted to see that it was in great shape - including the original bracelet!